New Sunroom Displays being built. 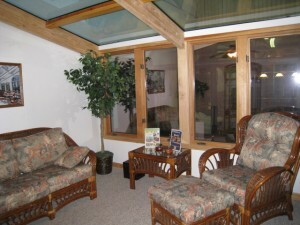 We currently are building three new premium Four Seasons Sunroom displays in our showroom. They will be ready soon for you to purchase at reduced prices. Call us today at 219-712-2702 for more information or to set up a showroom appointment to view available discounted displays. We have five full size displays in our showroom. We are selling them to make room for our new products such as Pergolas, Screen Rooms, Room Additions, and Bi-fold doors. 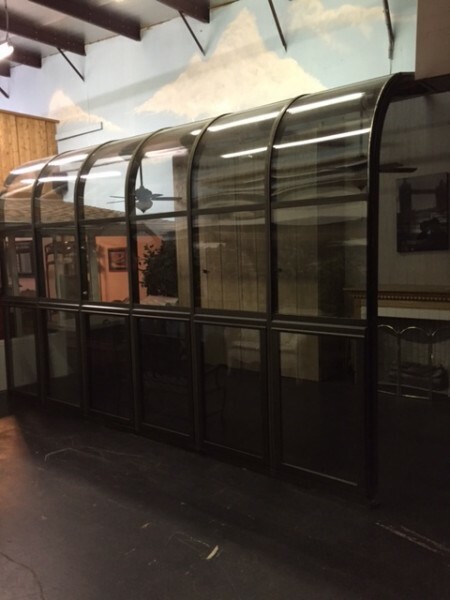 We recently installed this all glass two story unit in our showroom. 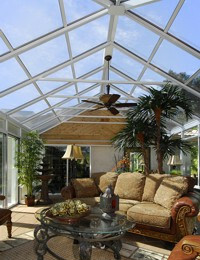 It features our BEST ConservaGlass with a lifetime warranty. There are awning windows in the complete first row in the front. There is one glass gable end included in this unit. We are offering a very special deal this Spring! Make Your Home Improvement Dreams Come True Today! Why Wait? There’s 365-Day Same-As-Cash! Make Your Home Improvement Dreams Come True Today! — Why Wait? There’s 365-Day Same-As-Cash! Loans provided by EnerBank USA (1245 E. Brickyard Rd., Suite 640, Salt Lake City, UT 84106) on approved credit, for a limited time. Repayment terms vary from 24 to 132 months. 16.84% fixed APR subject to change. Interest waived if repaid in 365 days. Contact us for more information about available financing packages.